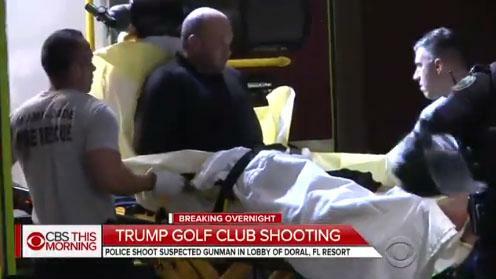 An anti-Trump man who was "ranting about the president" and actively firing gunshots at the Trump National Doral golf and spa resort in northwest Miami-Dade last night was shot multiple times by police, according to the Orlando Sun Sentinel. During the incident, which unfolded very quickly, an officer from the Doral Police Department was hurt, but not from gunfire. He was taken to a hospital, possibly with a broken wrist. "These officers did not hesitate for one second to engage this individual who was actively shooting in the lobby of the hotel," Perez said. Trump’s son, Eric Trump, tweeted his thanks to the Doral and Miami-Dade police departments after news of the shooting broke.